Here at Pioneer Animal Hospital there is no such thing as routine surgery, as general anesthesia for any procedure carries potential risks. Our state of the art monitoring includes a certified veterinary technician assessing vitals on the continual basis during the procedure and monitoring equipment to measure blood pressure, SPO2, CO2, EKG and temperature. 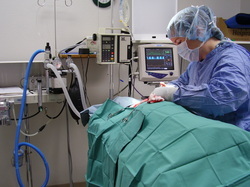 IV catheter and fluids are not optional for most anesthetic procedures to help support the patient before, during and after. Our doctors provide the following surgical services (including, but not limited to): ovariohysterectomy (spay), castration (neuter), soft tissue surgery, abdominal surgery, cesarean section, and dental surgery. If the doctors feel a specialist would benefit the patient we also offer surgical referrals.